Yesterday was New Year’s Day: a day for careful reflection of the year behind and what life has given you in it, a day for contemplation of the year ahead and the sort of better person you want to be at the end of it, blah, blah, blah, and all that jazz. What it really meant for me was that I was moving very slowly. If I’m honest, the veil of headachy confusion didn’t lift completely until evening. It was Day One of the bread making project, and I couldn’t even be bothered to make coffee. But I have my goal before me, and I was not about to be sidetracked on the very first day over a little revelry-induced fuzziness. A simple bread was in order, nothing fussy or complicated would do. Speed was also key; the faster I had a starchy food ready, the better off everyone would be. 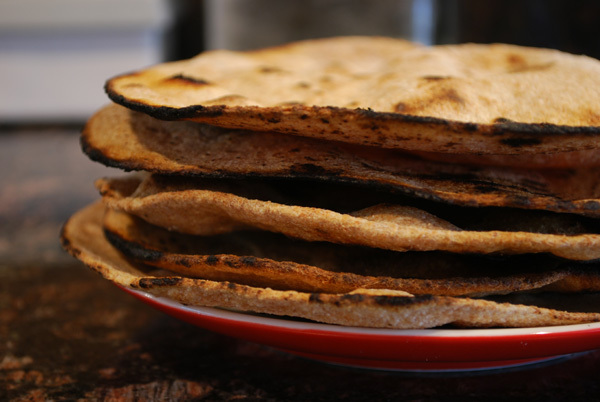 I settled quickly on a recipe for an unleavened Indian flatbread called chapatti. Typically eaten with lentils or curries, often in lieu of utensils, chapattis are one of many different and delicious rotis (flatbreads) from South Asia and Africa. They are certainly a direct descendant of what the very first bread must have been: simply flour and water, mixed together, and baked over an open flame. Chapattis are specifically made with whole-grain atta flour (made from durum wheat, which also makes semolina, or pasta flour); but I didn’t have any of that, so whole wheat flour would have to do. The other three ingredients, water, salt, and oil, are always on hand in my kitchen, so no worries there, and the short ingredient list left little room for confusion. But most importantly, unleavened meant there was no yeast to wait on. Perfect. This dough is a little ragged when first mixed together, but kneading brings it together nicely, and quickly. My pan wasn’t as hot as it perhaps should have been, but it did the job well enough. I believe they would’ve puffed up more if it had been hotter. But dipped in olive oil, they tasted just fine to me, and spread with leftover white and black bean dips, they were the perfect antidote to the excesses of last year. Now let’s see if I can avoid a similar fate at this time next year…. 1. Whisk together flour and salt in a bowl. Make a well in the center, and pour in the oil and 1/2 cup of the water. Gradually add remaining water, continuing to mix until flour absorbs the water. The dough will be very shaggy and clumpy. Turn out onto a surface and knead until smooth and elastic, about 5 minutes. Do not add more flour. Cover with a damp cloth and let rest for 30 minutes. 2. Divide dough into eight equal pieces and roll gently into balls. Cover the ones you aren’t rolling out. Roll each into a thin round, about 6 inches across, flouring the surface lightly if needed to keep dough from sticking. Do not stack rolled out dough. 3. Heat a griddle or skillet (cast iron is best, but whatever you have will work) over medium-high heat. Place one chapatti in the skillet and cook about 10 seconds, flip and cook for 1 minute, flip again and cook about 1 minute. Press down any bubbles that form so that bread cooks evenly (if you like, I couldn’t be bothered). Bread should puff up and have an even distribution of brown spots. 4. Place on a clean plate or baking sheet and keep warm in a 250 degree oven. Brush bread with melted butter or olive oil, if desired (I couldn’t be bothered with this either, but I’m sure it’s lovely). Serve warm if you can, but they taste just fine at room temperature. 1. If you don’t have a rolling pin, use an empty (clean) wine bottle. 2. For me, each chapatti cooked in the amount of time it took me to roll each one out. You don’t need to roll them all out first. 3. For a slightly chewier bread, substitute 1/2 cup of the whole wheat flour for all-purpose. 4. If you have leftover chapattis for some strange reason, you can cut them into wedges and crisp them in a 350 degree oven for a few minutes. Serve with hummus, guacamole, salsa, or any other favorite dip. (If you’re ambitious, you can brush them with olive oil or butter and sprinkle with a favorite herb or spice, before cutting.) Or just roll them up with scrambled eggs, or use for wraps for sandwiches. Oh, the possibilities of a good flatbread!